I noticed a new follower on my twitter feed a few weeks ago. His product, a shaving soap that caught my eye because of its unique packaging. A simple cardboard box and it was just something that I had to review. So I left Shwan a message and he agreed to give me a puck of his shaving soap called Himalaya. The main thing about this soap it’s formulated for sensitive skin. Everything about this soap right down to the packaging is done for that reason. WTF -I asked Shwan what was special about the soap and how did it all come about. Shwan - Well it actually started when I had issues with bad shaving products. I have very sensitive skin and didn't want to shave and at the same time don't want to grow a beard. I tried some shaving products but they would irritate my skin. I then started looking into making my own soap but I didn't like the process, so I found a soap manufacturer that was willing to work with a small startup. The issue with my skin was the ingredients that companies use and also the level of fragrance. As you can see from the ingredient list on our soap it's very minimal and all plant based and the scent is not strong, a higher level of fragrance does not work for me. 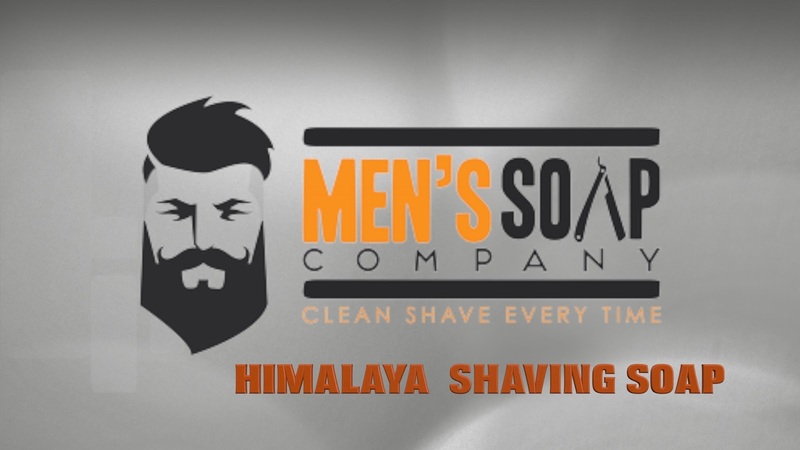 So Men's Soap Company started because I wanted a good shaving product and I wanted to help others facing the same issue I had. The feedback that we received from customers about the soap has been amazing. When you first examine the box you notice the top flap with the company logo. A full bearded modern looking man with mustache. The soap ingredients are listed on one of the side panel along with a description of how the soap is formulated on another and let me stress a point that this is for sensitive skin so the formulation is an all natural product that’s been enhanced by plant extracts. When you open the box the first thing you see is the Derby Extra 5 blade pack that is included with each purchase. (nice touch) then you have the puck. It’s wrapped in clear plastic but even wrapped you can still smell its terrific scent. Here are the details of the Himalaya Fragrance (a blend of exotic woods: Indian cedar, Himalayan blue pine, cashmere musk and Indian amber). Since this is a hard puck you have to bloom and I used my G20 scuttle. After waiting for 2min in hot water I started loading the brush and the lather exploded. During the loading I noticed something strange the scent was starting to get faint. Maybe it will present itself when I face lather? Oddly enough over the course of the shave the scent just about disappeared. I found that the lather was very impressive with the slickness and glide did lasted for the entire shave. It was a close shave with a great post shave feel but I did miss the scent and I know from talking with Shwan that it was done on purpose to reduce any irritation that one might have from a fragrance. I get it now but at the time I was disappointed. 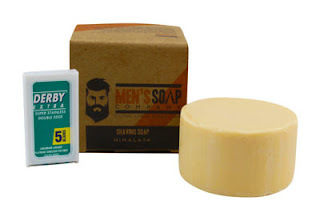 Shwan said he might look into making a soap with a little more fragrance added in the future since this is the only shaving soap currently offered at the time of this writing. I want to put this out there now. This is a glycerin based soap some would even say a melt and pour. I have used M&P before and I like them if done right and this soap is done right. So don’t let that keep you from trying it. The performance is topnotch even if your into heavy scented soaps don’t let that get in the way of trying this one.